Love shopping but looking for something unique or unconventional? Then check out our shortlist of under-the-radar London boutiques (strictly no big department stores) where you’ll find an outfit to make your friends and loved ones say “wow”! Here is our rundown of 10 of the best shops in central London carrying some of the world’s most stylish designers and iconic brands – all within easy reach of Montagu Place. So why not make a weekend of it with our special 15% discount offer? Open since March 1999, Aimé defines itself as unique and you’ll feel a different vibe as soon as you walk in. The owners, two half-French half-Cambodian sisters Val and Vanda Heng-Vong, select exclusively French designers or other European names that are creating a buzz like Italian brand Forte Forte. It has a children’s store next door with a further branch in Shoreditch. If you like to buy beautiful things that you won’t see everywhere else, then it’s well worth checking out! Anya Hindmarch Bespoke is a wonderful retro space launched in 2009 on Pont Street. At this unconventional store they’ll inscribe your bag with individual initials making your bespoke piece even more unique. This exclusive piece of workmanship can be executed either on the little inside pocket of a chosen bag or on its outside flap. Well-known for selling beautiful clothes from world-famous international designers ranging from Nina Ricci to Marni, this chic store was created in 1986 by Peter and Josephine Turner who are renowned for using their personal judgement to discover up-and-coming labels to showcase within their boutique, including the likes of Peter Pilotto and more. 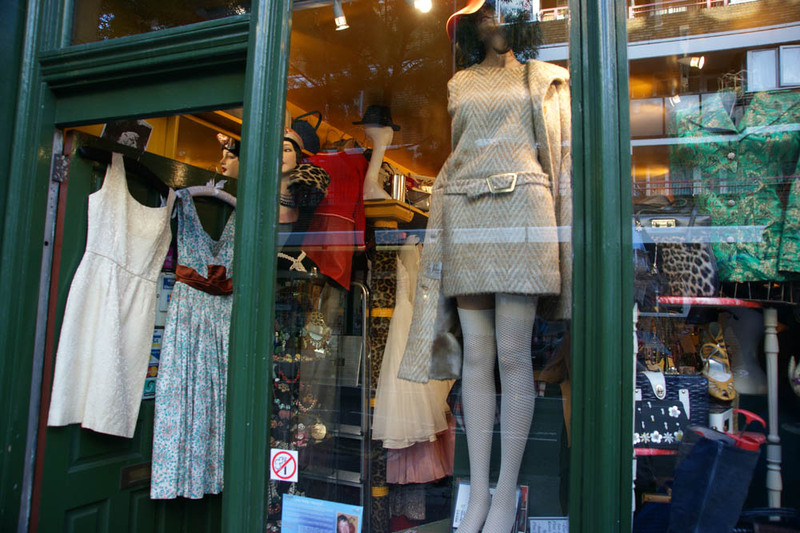 In the heart of Covent Garden, this vintage store quickly established a reputation as one of the top vintage destinations in London; it stocks apparel, accessories and costume jewelry from the 1920s to the 1980s offering the option both to buy and hire. This multi-brand and concept store was created 12 years ago by Comme des Garçons’ designer Rei Kawabuco; it’s currently one of the most desirable shopping destinations in Mayfair and one the most influential stores in the world. It consists of 5 floors dedicated to the most important and exclusive labels in the fashion world, providing a true fashion immersion experience with an atmosphere inspired by the theme of “Beautiful Chaos”. Launched in 2004, Kabiri leads the way in contemporary designer Jewellery offering both own-range pieces designed by its owner Nathalie Kabiri and fine jewellery ranging from fashion pieces to more classical ones. This is one of the most diverse jewellery destinations in London and is just a short walk from Montagu Place. This multi brand boutique has always been a destination for its impressive range of international labels, from Celine to Lanvin, alongside the eponymous collections. It was the first to sell Prada in London and brought Kenzo to the world’s attention. This boutique has create a new way to experience both shopping and fashion itself. In the heart of Chelsea, this concept store has quickly become the shopping hotspot for London’s top celebs and fashionistas. It offers hi-tech toys and cold pressed juices alongside its collection of haute couture garments which will leave you speechless. Seeing is believing! Founded in 1999 by two schoolmates Harriet Vine and Rosie Wolfenden; Tatty Devine is an independent British jewellery company whose funny and colorful collections are mostly hand made using unconventional materials such as perspex, wool and anything else that has caught designers’ eye. Owned and curated by Belle Robinson, this boutique provides a unique luxury shopping experience; with items covering select womenswear and menswear ranges as well as beauty and lifestyle items, showcasing international collections and up-and-coming labels. This huge store also collaborates with talented artists by hosting events throughout the year, so that every time you visit you feel part of something new. Planning a London shopping weekend for Christmas shopping or the January sales? Contact us directly at the hotel via stay@montagu-place.co.uk or by phoning +44 (0)207 4672 777 with your requirements and we’ll be happy to map out your dream shopping itinerary, ready for when you arrive at the hotel.